The search area for the missing Malaysia Airlines Flight 370 will be expanded by another 60,000 square kilometers (23,000 square miles) in the Indian Ocean if the jetliner is not found by May, officials said Thursday, affirming their commitment to not give up until it is located. Malaysian Transport Minister Liow Tiong Lai said that Malaysia, Australia and China, which are leading the hunt for the Boeing 777 that went missing on March 8 last year, are "committed to the search." "If the aircraft is not found within the 60,000 square kilometers, we have collectively decided to extend the search to another 60,000 square kilometers within the highest probability area," he said. However, searchers are hopeful that they can find the plane in the current search area, he said. The announcement removes some ambiguity about the future of the search as it was never made clear what would happen if the plane is not found. It will also come as a solace to the relatives of the victims, who are holding out the hope of recovering the bodies. Liow said the two areas together would cover 95 percent of the flight path of the plane, which went missing while on a flight from Kuala Lumpur to Beijing with 239 people on board. Most of the passengers were Chinese. It dropped off the radar, and investigators using satellite data later figured out that it made a series of turns and headed in a completely opposite direction from where it was going before crashing into the Indian Ocean. "We are confident we are searching in the right area," Australian Deputy Prime Minister and transport minister Warren Truss said at the news conference, alongside Liow. "We are confident we have the best search equipment ... if the plane is in the area we will find it." He said Malaysia and Australia will continue to fund the cost of the next phase of the search. He or the other ministers did not say how much it would cost. "Australia and Malaysia have been sharing the cost and we will continue to do that," he said. "We are confident we will be able to fund whatever is necessary." In the first phase, a total of 120 million Australian dollars ($93.6 million) was spent by the two countries, split equally, and Liow said the next phase is estimated to cost A$50 million ($39 million). The lower cost is because the equipment has already been purchased. The two ministers said they expect the second phase to take the rest of this year. But it is likely to be hindered by bad weather as winter sets in soon in the southern hemisphere, where seasons are opposite that of the northern hemisphere. A statement issued after the meeting said the ministers also agreed on plans for recovery activities, including securing evidence, in the event the aircraft is found, but gave no details. In late January this year, Malaysia's government formally declared the plane's disappearance an accident and said all those on board were presumed dead. A comprehensive report into the disappearance found no significant anomalies in the flight, except that the battery of the locator beacon for the plane's data recorder had expired more than a year before the jet vanished. That still does not explain what caused the plane to veer so off course in what has become aviation's biggest mystery that continues to confound experts and investigators alike. At the same time, the relatives of the dead have got no closure and many still believe that their loved ones may be alive amid a host of conspiracy theories including one that the plane was hijacked and landed somewhere safely. One theory also has the plane flying west to Maldives. Truss said the plane may have had enough fuel to reach Maldives but it would have been impossible for it to be in the reported area in daylight and not be seen by anyone. Also, the flight path to Maldives would be inconsistent with satellite and radar data. "It is not considered a likely possibility," he said. China's transport minister Yang Chuantang said China may contribute vessels and other assets in the next search phase. "We will marshal some physical assets including vessels to participate in the search," he said. "We will not waver in our commitment to continue the search until we find the plane and resolve the mystery." The software system for maintaining the F-35 fighter jet gives false-positive readings 80 percent of the time, the House Armed Services subcommittee has learned - a problem that could lead to even more delays with the jet's development. The F-35's Autonomic Logistics Information System (ALIS), a next-generation software system designed by Lockheed Martin to identify maintenance issues, is plagued with problems and could delay development. An Indonesian fighter jet caught fire just before taking off with other aircraft, forcing the pilot to abort the mission and jump to safety as flames and thick smoke engulfed the aircraft. The plane had been due to take off from a Jakarta airbase with three other jets, which took off successfully, in preparation for security support at the summit of Asian and African leaders in Indonesia next week. But the jet suddenly caught fire and could not make the flight. The cause was under investigation. "As the aircraft was about to take off, there was a fire in the engine, and the pilot straight away decided to abort the flight," air force chief of staff Agus Supriatna said on news channel MetroTV today. The pilot escaped with minor injuries and is now being treated in hospital. "The pilot was rushed to hospital but he is conscious," Supriatna added. Military spokesman Fuad Basya said the airman suffered a minor injury as he jumped from the cockpit. The F-16 was one of several aircraft that the United States recently provided to the Indonesian military in the form of a grant, the air force said. The accident came a month after two air force planes from an Indonesian aerobatics team crashed during a practice session ahead of an air show on Malaysia's Langkawi island. All four pilots ejected successfully and survived. Investigators work at the site of a plane crash near Bloomington, Ill., on April 7, 2015, that claimed the lives of seven people. The Cessna 414A took off from Indianapolis and crashed just short of Central Illinois Regional Airport after midnight on its return from the NCAA men's basketball championship game. The plane that crashed near Bloomington last week, killing seven people, climbed away from the runway, turned and began a short series of descents and climbs before crashing into a farm field, according to a preliminary report from the National Transportation Safety Board. The report released Wednesday did not indicate any possible cause for the April 7 crash or say why the pilot appeared to have aborted the landing. The last recorded radio transmission from pilot Thomas Hileman to air traffic control did not indicate any problems or distress aboard the twin-engine Cessna 414A, built in 1980. Bloomington was shrouded in dense fog as the plane approached Central Illinois Regional Airport shortly after midnight. The NTSB report says there was an overcast ceiling at 200 feet above ground level, with a half-mile surface visibility. The plane was returning from Indianapolis, where the passengers, including two members of the Illinois State University athletics department, had attended the NCAA men's basketball championship game. Hileman, 51, and all six passengers died on impact, the coroner said. Aaron Leetch, 37, ISU's deputy director of athletics for external operations, and Torrey Ward, 36, associate head coach of the Redbirds men's basketball team, were among the victims. Also killed were Terry Stralow, 64; Woodrow "Jason" Jones, 45; Scott Bittner, 42; and Andrew Butler, 40. The NTSB typically releases an initial report about a week after plane crashes, but the full investigation of the Bloomington crash may take up to 18 months. Hileman had a valid flying certificate and about 12,000 hours of flight experience. Rob Mark, an Evanston-based commercial pilot and flight instructor who edits an aviation blog at jetwhine.com, said the plane's instruments may have malfunctioned or the pilot may have become disoriented. "What a strange-looking accident," Mark said. "Everything looked good as they approached the airport, and then they were doing some strange stuff." Mark also said investigators will be looking into the instrument landing system, which connects the airplane with the airport, for any problems. Hileman was using the system to line up with the runway and land, the NTSB said. There is no voice recorder on a Cessna 414A. The fact that the plane was able to climb suggests both engines were functioning properly, Mark said. Investigators should be able to make that determination by reviewing the wreckage, though determining whether the instruments were working may be a tougher task, he said. Anthony Brickhouse, associate professor of aerospace and occupational safety at Embry-Riddle Aeronautical University in Daytona Beach, Fla., said he would be focused on the plane's multiple course corrections and the weather - a 200-foot ceiling "is really low" - if he were investigating the crash. "That approach is not something you typically would see," Brickhouse said. "Investigators also will be looking at the aircraft. Was there something mechanically wrong? You can be following your instruments to a T, but if they're giving you bad information or not functioning properly, that's going to have a negative impact on you." In the last radio transmission from Hileman, recorded about five minutes before the crash, he indicated the plane was nearing Runway 20 at Central Illinois Regional Airport. The plane was lined up with the runway at 12:04 a.m. and descended to 1,400 feet about 1.7 nautical miles north of the beginning of the runway, according to the NTSB. But in the next 34 seconds, the plane climbed 600 feet, then "began a descending left turn to an easterly course" away from the airport. At that location, a typical "missed approach," in which the pilot abandons a landing because the runway is not visible at low elevation, would mean heading to the west, not east, to circle back for another try, Mark said. The plane descended to 1,500 feet, then climbed again to 2,000 feet while heading east, according to the report. Within the next 38 seconds, the plane went up and down in the air. It went from 1,600 feet to 1,900 feet back to 1,600 feet, the elevation recorded on the final radar return at 12:06 a.m. about 2 miles east of the airport, near where the crashed plane was found by emergency personnel about three hours later. Only flag carrier Philippine Airlines and budget carrier Cebu Pacific are out of the EU's list of airlines that fail to meet international aviation standards. "The EU safety assessment visit to the Philippines will seek to confirm that the CAAP has addressed the root causes of previous areas of concerns and is able to conduct effective oversight of air carriers certified in the Philippines," CAAP said in a statement on Thursday. Also in the meeting were Air Asia Inc. representative Marianne Hontiveros, Air Asia Zest's Josephine Joy Caneba, Air Philippines' Bonifacio U. Sam, Island Aviation Inc.'s Capt. Benhur Gomez, Magnum Air's (Skyjet Inc.) Capt. Teodoro Fojas, Southeast Asian Airlines' (Tiger Airways) Michael Shau and South East Asian Airlines (SEAIR) International Inc.'s Avelino Zapanta. Dubai ruler Sheikh Mohammed bin Rashid al Maktoum on Thursday issued a new law on aviation safety in the emirate which includes the regulation of the use of drones in local airspace. Sheikh Mohammed, also Vice President and Prime Minister of the UAE, has taken action to enhance safety and security measures in Dubai's airspace. A statement said the law aims to organise the activities and profession in the civil aviation industry and "prohibit all acts that may endanger airplanes, airports or any facility related to aviation services". The law also authorises Dubai Civil Aviation Authority (GCAA) to specify the airspace dedicated for general aviation and the regulation controlling the usage of laser, fireworks, light beams and drones. The authority can also reserve the right to inspect towers and helipads. In January a recreational drone caused Dubai airport to suspend operations for almost an hour after the device flew near critical flight paths. Last month, it was reported that Abu Dhabi had banned the sale of recreational drones pending new regulations to control their use. The law obligates civil aviation workers in Dubai to obtain an annual permit from the DCAA, with penalties and fines to be imposed on violations. The new law also says the DCAA may "inspect and monitor all civil aviation activities and civil aviation workers, and may also define any acts that constitute risk on aviation facilities, air operations, airplanes, passengers and air traffic". 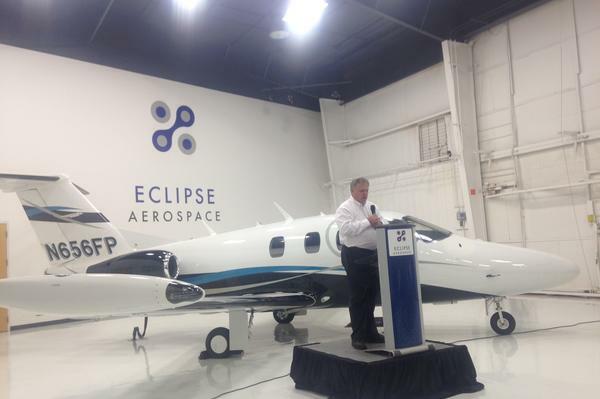 Superior, Wis.-based Kestrel Aircraft has merged with New Mexico's Eclipse Aerospace to form new aircraft company One Aviation Corp. The Duluth News Tribune reports on the deal, which will combine Eclipse's twin-engine light jet with Kestrel's in-development turboprop. Kestrel CEO Alan Kapmeier, who also founded Duluth's Cirrus Aircraft, will lead the combined company; Eclipse CEO Mason Holland will be chairman. Albuquerque Business First, meanwhile, has a report on what the deal means for Eclipse, which will keep its Albuquerque production line. The FAA has published a list of 736 redundant or underutilized VOR and NDB standard instrument approach procedures that it proposes to eliminate as the agency moves forward with implementation of the NextGen satellite-based air traffic system. The long-awaited list, published in the Federal Register in a notice of proposed rulemaking on April 13, was based on criteria established in 2014 by the VOR Minimum Operational Network Working Group, in which AOPA participated, said Melissa Rudinger, AOPA vice president of government affairs. "The goal of the working group is to ensure that a scaled-back VOR system is maintained well into the future, even as the system and operators move to satellite-based navigation," Rudinger said. Members may submit comments to the FAA on the list by May 28 as provided below. The FAA said "complexity and cost" ruled out maintaining all existing approach infrastructure during the transition to new technology. The agency originally set a target of reducing the number of VORs from approximately 967 operating in late 2012 to 500 in service by Jan. 1, 2020, the target date for full implementation of NextGen. However, based on industry feedback and coverage requirements, the FAA has revised that target to 867 VORs in service by Jan. 1, 2020, and 667 by 2025. "As new technology facilitates the introduction of area navigation (RNAV) instrument approach procedures, the number of procedures available in the National Airspace System has nearly doubled over the past decade. The complexity and cost to the FAA of maintaining the existing ground-based navigational infrastructure while expanding the new RNAV capability is not sustainable," it said in the notice. Members may review the list of instrument approach procedures selected for elimination in the Federal Register notice, or on the FAA website. To submit comments on the proposal by May 28, please cite docket number FAA-2015-0783. Comments may be submitted online or by mail to Docket Operations, M-30; U.S. Department of Transportation (DOT), 1200 New Jersey Avenue SE., Room W12-140, West Building Ground Floor, Washington, DC 20590-0001.
contact me via e-mail at halhallaf2014@my.fit.edu or by Cell phone at (386) 847-7671.